Students on the campus of Harvard Law School in Cambridge, Mass. Forty percent of the current Congress attended law school—54 percent of senators and 37 percent of House members have a law degree. 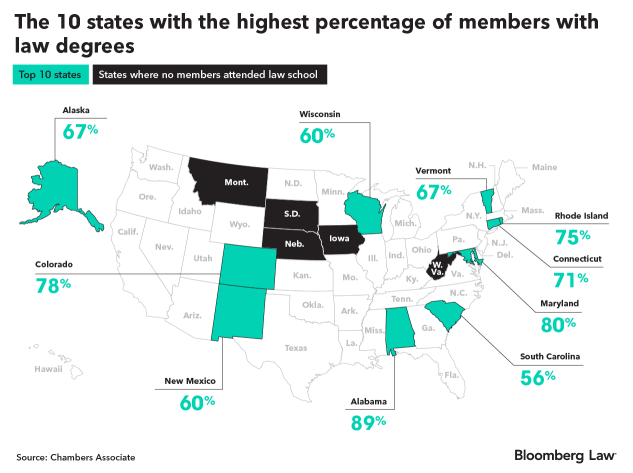 Thomas Lewis from Chambers Associate takes a look at what law schools they attended, including breakdowns by elite school attendance, party line differences, and state representation. Obama studied law at Harvard, Bill Clinton at Yale (alongside Hillary). Nixon learned his way around the law at Duke, while FDR did the same at Columbia. A legal education has long served as a springboard to a political career. But past presidents are one thing—how common is it in 2019? Chambers Associate research found that, of the 535 members who make up the 116th Congress, 40 percent had attended law school. 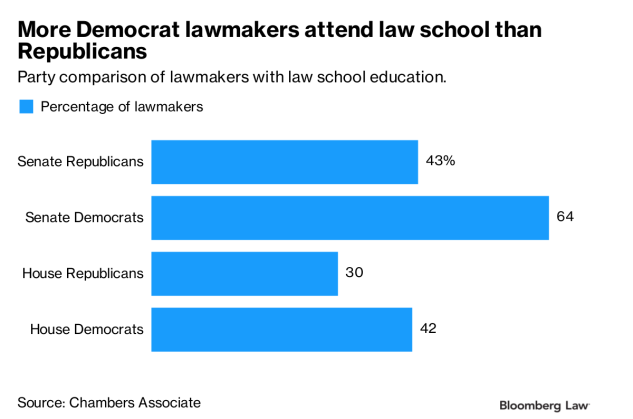 A legal education was even more common among senators—54 percent attended law schools, as opposed to 37 percent in the House. The results are most fascinating when broken down along party lines. 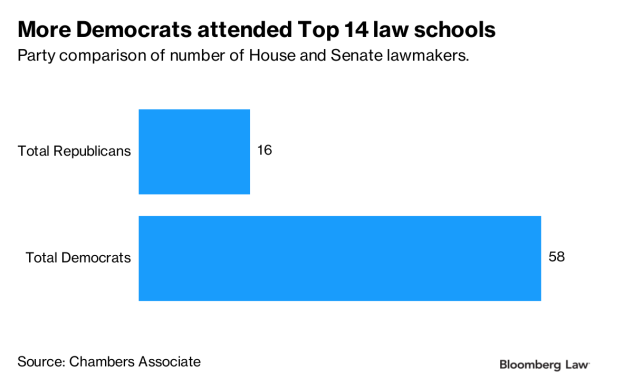 Whether in the House or the Senate, a higher proportion of Democrats had attended law school than their Republican counterparts. In fact, if we narrow our focus onto the elite “Top 14" law schools—a grouping based on US News rankings—the results become even more pronounced. Harvard Law is the best example. Tea Party-darling Sen. Ted Cruz (R-Texas) may have attended, along with three other Republican senators, but the school’s alumni are overwhelmingly Democrat. Four Democratic senators attended the Massachusetts institution, as did 15 House Democrats. The number of House Republican alumni? Zero. A fair explanation for this would consider the school’s location in a solidly blue state, its courses and community links. But, if we look at the trend across the T14 as a whole, it’s hard not to see the “elite” label they wear as a factor. The identity politics of modern day America would provide an easy answer: these elite institutions stand in stark contrast to the GOP (so the narrative goes), the natural home of self-made business people whose authority stems from their understanding of the everyday America they inhabit, rather than the minutiae of case law. Inevitably, some schools are more popular among legislators than others. Topping the table by some way are Harvard and Georgetown, schools whose elected alumni are spread across an array of states. It’s a very different story with Texas Law, which has a singular influence on its home state. All seven of the representatives it produced are in Washington on behalf of a Texan district. The case of Alabama, Alabama Law and Cumberland Law is very similar, and gives the impression that law schools can still serve as gateways to their home states’ positions of power. Altogether the results are a stark indication of the responsibility law schools bear. As well as providing talent for law firms, in-house teams, government departments and non-profit organizations, we now know they equip 40 percent of Congress with skills they use to represent their constituents. We think the finding that roughly half of Congress are cut from the same educational cloth raises some important questions about its ability to be representative of American society. The results support one other distinction. Some schools are excellent at satisfying the sizeable appetites of top law firms. Others are heavily populated by, and better serve, students looking for a public role. In 2018, Law.com detailed the 10 law schools sending the highest percentage of their graduates to BigLaw jobs. 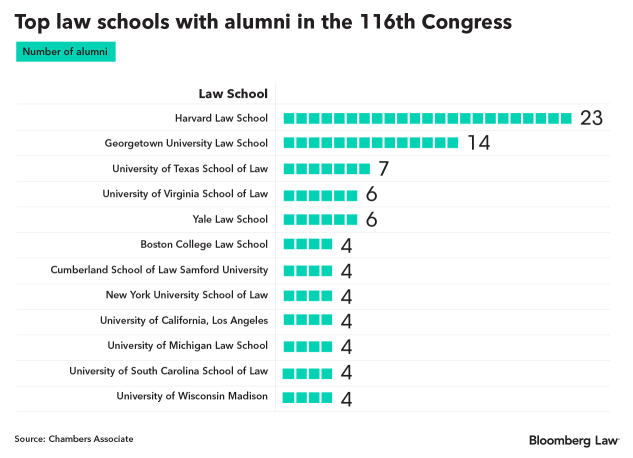 Compare that list against the 10 schools with the most alumni in Congress, and only three schools appear twice: UVA, Harvard and NYU. Columbia, the school which sends the highest percentage of its students to BigLaw, has only one alumnus with a seat in Congress: Rep. Ben McAdams (D-Utah). The qualifications of politicians are a perennial point of contention. Some people idolize real-world experience and realism, others would rather their leaders were educated to the hilt and idealistic—I doubt we will ever reach agreement on this issue. What we can say is that these findings display an encouraging loyalty to the study of law as a means of governing effectively. Abe Lincoln and Thomas Jefferson might not like much about the America of today, but I reckon they’d be happy about that. Tom Lewis is deputy editor of Chambers Associate, a publication providing students with a guide to America’s top law firms. His previous research has touched on the LSAT, law review and the effects of globalization on law firms.